Alumni and Development Office (“ADO”) organized a fund-raising campaign in November to celebrate the Ceremony for the Conferment of Honorary Degrees and Higher Degrees 2017. Approximately MOP11,000 were raised through the whole campaign. All contributions will be donated to the University of Macau Development Foundation in supporting the long term development of the University. 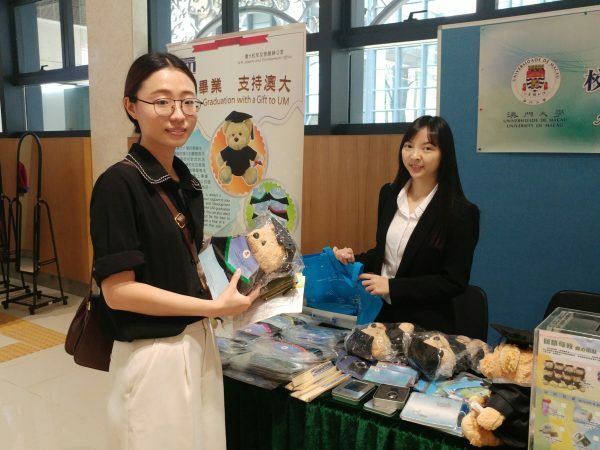 To boost alumni support and cultivate the idea of giving back to their Alma Mater, ADO organized different fund-raising campaigns in recent years. The campaign received overwhelming responses from students, alumni and their parents this year. Numerous pre-orders of graduation bears were received before the ceremony. To appreciate the supports from students and alumni, ADO will continue to accept orders of souvenirs. Interested parties can make their orders by sending email to donation@umac.mo. You are also welcome to visit the ADO office (N6-2021) or contact us at 8822 4243 during office hour.